Eye surgery is, as the word describes, surgery performed on the eye. Where in the past this was done very rarely and only in case of medical emergency, eye surgery is now also available for cosmetic reasons. Laser eye surgery, as it is most commonly known, is used to restore and enhance vision in the eyes to 20-20 vision, eliminating the need for wearing contacts and/or glasses. Many people have described an almost miracle like feeling, due to the speed and efficiency with laser eye surgery. Laser eye surgery is a very popular cosmetic procedure that is generally affordable and quick. Accuvision eye surgery offers the latest technology in their wavefront LASIK procedures. This means the procedure is safer and the healing time is much shorter. They also pride themselves on often being able to accept patients who have been refused somewhere else in the past, due to having complicated prescriptions or other issues. Accuvision’s service is highly transparent and they pride themselves on the very positive feedback they have had from their patients. They also offer life time after care, meaning your eyes will remain in safe hands for the duration of their life time. The Lasik procedure, the most popular of its kind, takes only around 5 minutes to complete and is pain free. Patients remain awake during the procedure and are usually given some local anaesthetic (eye drops) to numb the eye. This first stage of the procedure is to remove a thin flap which exposes part of the cornea. Secondly, the cornea is treated and reshaped using a laser. Lastly, the flap is placed back and your vision will be restored. Accuvision has so much faith in their procedure that they will do both eyes on the same day if required. Prices will vary on the exact treatment you require. However, Accuvision is very happy to consider matching any like for like quote, so you are sure to receive a good deal. Their initial consultation is free. Accuvision is very honest about their prices and will not try to lure you in with promises of cheap treatment, when this is generally only applicable if you have only a very small prescription. Accuvision also offer surgery for other eye health care conditions, like cataracts and keratoconus. 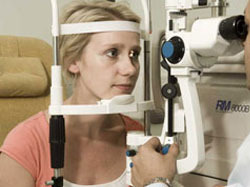 Accuvision have clinics in London, Leeds and Birmingham. So, whether you are looking to correct your vision so you no longer need glasses or contact lenses, or whether you are looking to resolve an eye health care condition, you are sure to be in very safe hands with Accuvision. They will be very happy to discuss their credentials with you and show you that their surgeons are fully qualified. Prices will vary depending on what treatment you require, but their initial consultation is free, meaning you can get advice on what treatment option is best for you. Accuvision will give you transparent and concise advise before you decide whether or not to go ahead.